Molasses Creek Journal: News from Ocracoke Island and Beyond: Molasses Creek to open for Bluegrass Legend Ralph Stanley this coming Sunday (July 7)! 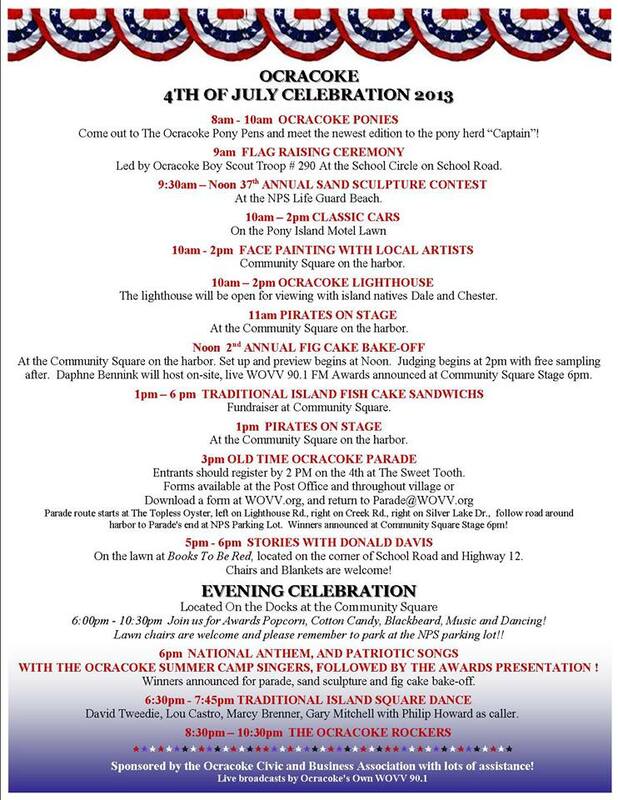 . . .and 4th of July happenings! Molasses Creek to open for Bluegrass Legend Ralph Stanley this coming Sunday (July 7)! . . .and 4th of July happenings! The big news for Molasses Creek this week is that we get to open for Ralph Stanley on Sunday, July 7 at Waterside Theater (home of the Lost Colony), Roanoke Island, NC. Molasses Creek begins the performance at 7 PM, and Ralph Stanley and the Clinch Mountain Boys at 8 PM. We have more details for the concert at the end of this blog. . .
Dr. Ralph Stanley has long been an icon of American roots music, beginning in 1946 when he formed the Stanley Brothers duo with older brother Carter and later with the formation of the Clinch Mountain Boys. Stanley’s band has nurtured several musicians who later went on the become stars in their own right, including Ricky Skaggs, Larry Sparks and the late Keith Whitley. Along the way Stanley received an honorary doctorate of music from Lincoln Memorial University, the National Heritage Award presented by President Reagan, the Library of Congress’ Living Legend Award, and the National Medal of Arts. Stanley was inducted into the International Bluegrass Music Hall of Honor in 1992 and was inducted into the Grand Ole Opry in 2000. Although well-known and respected in music circles for decades, it was only with the release of the Cohen brothers film O Brother, Where Art Thou? and it’s soundtrack that Stanley’s mournful voice was introduced to a mass audience. The album, named by National Public Radio one of the 50 most influential recordings of all time, sold more than 8 million copies and earned Stanley a Grammy Award for Best Male Country Vocal Performance. 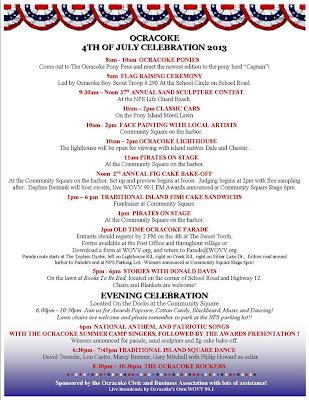 The 4th of July is a big deal on Ocracoke and we have plenty of fun for folks visiting the island. Here is the schedule below. Since the 4th is a Thursday this year, we are moving our Molasses Creek concert from the regularly scheduled Thursday night to Friday night so that we can play for the traditional Ocracoke Square Dance at 6:30 PM at the Ocracoke Community Square. Come see Molasses Creek at Deepwater Theater on Ocracoke Island! We have had a busy summer so far at Deepwater Theater with two weeks of sold out shows! Hope that you will come and see us at the Ocrafolk Opry on Wednesdays or a full Molasses Creek show on Thursdays at our Deepwater Theater. Shows are at 8 PM and run through the end of September. You can reserve tickets ahead of time online at our Deepwater Theater page or by calling 252-921-0260. Ocracoke Ladies Strongarm the Competition! 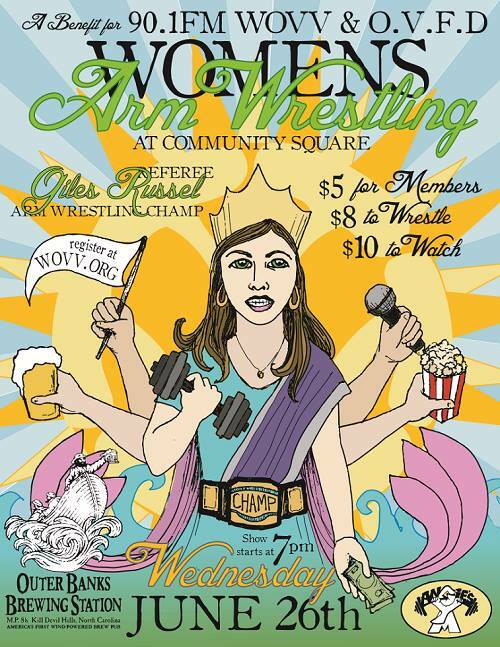 Unfortunately we had a show to tend to and weren't able to catch the annual WOVV (Ocracoke Radio), Women's Arm Wrestling competition this last Wednesday. But, we can tell you all about it! 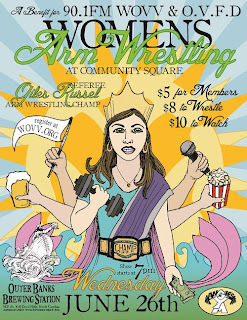 Last year, this annual event became the largest women's arm wrestling competition in the United States, and this year IN THE WORLD! The names just about say it all . . . Karm the Arm, Ming Raster the Ring Master, Librawnian, Princess Slaya, Marie Antoilette, Mastadoane, Paula Mean, Bend it Like Bennink, Snow Might, Outer Spanx, Fat Jesus, Professor Pain, G.I. Gyn, Mind Game, Lyonysus, Silver Catron, Bridezilla, Mermaid's Fury, Daisy Puke, Rosie the Ligament Breaker, Gooey Geisha, Fighting Melons, Miss 'Merica, Crusher the Clown, Annie's Got Her Guns, The Butcher, Sandy "Just Sandy" from Jersey, Veruca "The Seether" Salt, Tiny Dancer the Ice Princess, and more that you gotta read and see (but we won't publish here. Visit the Ocracoke Current article for great pictures! Each year, friends travel to the island during the summer to soak up the sun on our wonderful beaches, sample our stellar island cuisine, and get their fill of village culture. Occasionally these visitors bring with them their instruments to share their music with the band. This last week, Lillie Myers and family caught our Deepwater shows and stopped by Fiddler Dave's house to say hi to Fiddler Dave's son, Lachlan, and play a few tunes. What great fun! Thanks for coming by Lillie! Hope everyone's summer is going great and that you will see us out on Ocracoke or on the road! Waterside Theatre, the area’s newest musical venue and home to Roanoke Island’s very own Tony Award-winning theatrical production, The Lost Colony, welcomes two Grammy Award-winning artists to the Outer Banks as part of the PNC Bank Presents: Live At The Waterside Concert Series. On Sunday, July 7 at 8 p.m. Dr. Ralph Stanley brings his Clinch Mountain Boys to The Lost Colony’s beautiful) stage for an evening of all-American bluegrass music. Ocracoke Island band Molasses Creek (award winning band that has been featured on Garrison Keillor’s A Prairie Home Companion) will open the evening at 7 p.m. with their blend of traditional Americana music and contemporary performance style. Doors open at 6 p.m. and tickets for both regular seating ($25) and VIP seating ($50) are available online at The Lost Colony website. The limited number of VIP tickets include seating in the first few rows from the stage, access to the air-conditioned lounge set up in The Soundstage Theatre which will offer beer, wine, soft drinks and snacks, a limited edition poster, plus an opportunity to meet the musical artists and their bands! Both concerts are rain or shine events and rain insurance is not offered. Long regarded by locals and visitors as a top-notch musical venue waiting to happen, Lost Colony staff worked closely with officials at the National Park Service to bring this year’s two-concert series to Waterside Theatre. The planning and procedures put in place for the shows this summer will pay off big time for what is expected to be a six or eight concert series in 2014!